Fix 1.2x ratio magnification for short distance shooting or for snap-shooting, then rotate to 6x to provide more precise aiming. 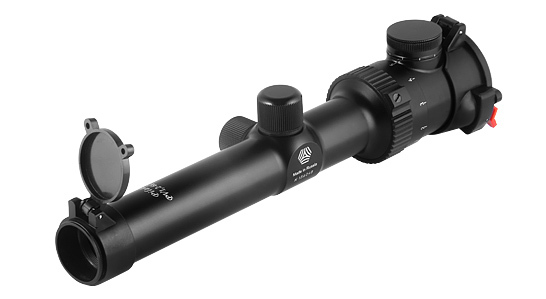 Can be compared to a RedDot sight, but has got advantages of 6x magnification rifle scope. Magnification is changed smoothly, you may stop at any intermediate level. The size of reticle remains unchanged at any level of magnification ratio. Operational temperature: from - 40С to +50С. 9 brightness levels of illuminated red reticles.